When we’re feeling anxious, we’re more likely to turn to unhealthy coping mechanisms. Whilst some people turn to cigarettes or alcohol, others turn to food. Overeating as a way of managing the symptoms of anxiety is something that can happen without you even realising it. Anxiety can make us feel overwhelmed and stressed, and the desire to distract ourselves from this feeling is pretty normal. Trying to soothe your anxiety with food might seem like a healthier way to cope than turning to alcohol, drugs or cigarettes however it can have a significant negative impact in the long term. Often those who overeat when anxious will feel shame and remorse at having eaten so much, which in turn can make us feel more anxious. In our modern world, we no longer turn to food simply to satisfy hunger. We use it as a reward, a celebration or a pick-me-up when we’re feeling down. This isn’t necessarily a bad thing in moderation, however for some people eating can become their primary emotional coping mechanism when stressed or sad. The problem is that the symptoms of anxiety can’t be treated with food. To manage the symptoms of anxiety we need to get a better understanding of what type of anxiety we’re experiencing and what techniques work for us specifically. For most people a combination of seeing their GP, therapy, medication, exercise or lifestyle changes can alleviate symptoms but it is different for everyone. It’s not all just in your mind either. When you’re feeling anxious your body produces cortisol which in turn can trigger cravings for salty, sweet and fried foods. So it’s not just a matter of ignoring the impulse to eat, it’s about tackling what’s making you feel anxious in the first place. What can I do instead of eating when I feel anxious? Tackling your symptoms of anxiety head on is the obvious answer. But it’s not always that easy. Minimising your stress is not always an instant fix so it might help to have some healthier ways to manage your stress than reaching for the cookie jar. Talk to someone: Whether it’s a friend, a trusted colleague or even a healthcare professional sharing your problems can help you feel less alone. Get moving: Instead of reaching for a snack, go for a walk or hit the gym. It might be the last thing you want to do but the after effects will be much more beneficial. Even if it’s just a quick lap around the block, getting some fresh air and stretching your legs can clear your mind and give you a fresh perspective. Re-define the word treat: we’re all guilty of thinking of a sugary snack as a treat. And in small doses it is! However if you’re treating yourself too often, try and re-program your mind. Try treating yourself to a cup of herbal tea, a bath or half an hour with your favourite book. Could I have a binge eating disorder? Binge eating disorder and comfort eating are very different things and it’s important to draw that distinction. People with binge eating disorder will regularly eat large quantities of food rapidly in a short period of time (usually within two hours). They will often feel completely out of control and unable to stop themselves from eating. 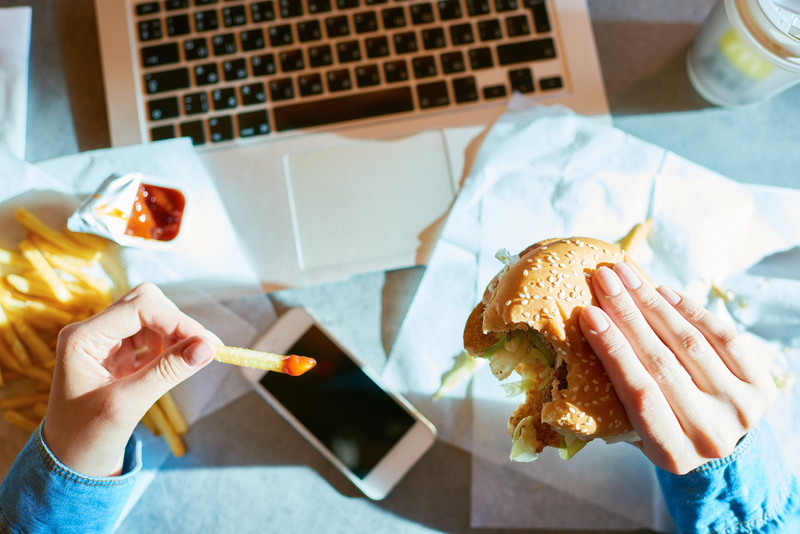 Whilst both result in feelings of shame and guilt, binge eating disorder also manifests in a preoccupation or obsession with eating, rapid weight gain, heightened feelings of self-loathing and feelings of extreme distress. Long term, this condition can result in many health problems including cardiovascular disease, type 2 diabetes, high blood pressure and arthritis. If you suspect that you or a loved one might be experiencing a binge eating disorder you should seek support from your doctor who can help you address both the physical and psychological effects of the disorder. If you’re having trouble managing your anxiety and turning to unhealthy coping behaviours, our partner beyondblue has some great tips for you. Try to bring down the overall stress levels in your home or work life as much as possible. beyondblue has some great anxiety management strategies you might find useful. Develop different ways of dealing with stress. For example: go for a walk, watch a movie or take up mindful meditation. Get a better understanding about the type of anxiety you’re experiencing – whether it’s social anxiety, a specific phobia or general anxiety. Talk to your GP and consider undertaking a GP mental health plan and/or asking for a referral to a psychologist. Visit the beyondblue online forums to talk to people with similar experiences and get some advice and support. Is arthritis affecting your mental health?